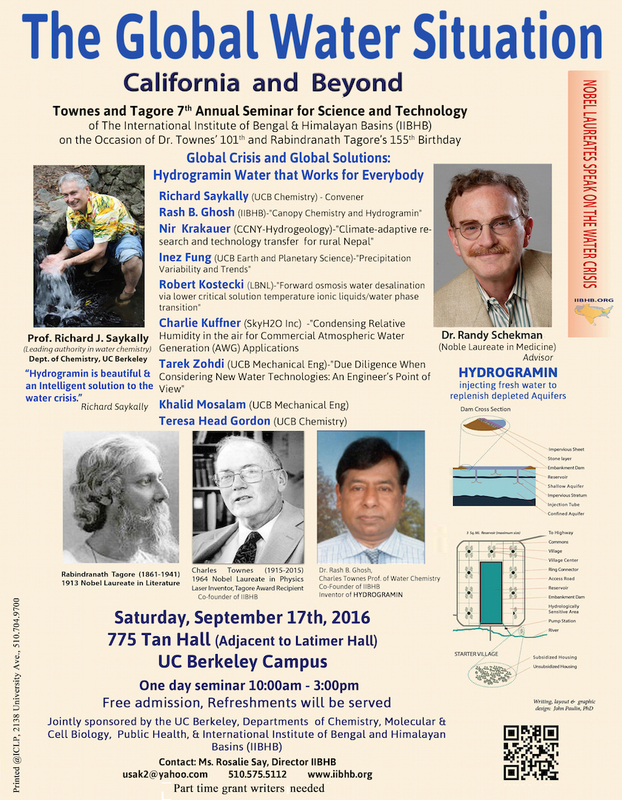 On Saturday September 17th, 2016, the International Institute for the Bengal and Himalayan Basins (IIBHB), a nonprofit organization located in Berkeley, California, will hold its 7th Annual Townes and Tagore Seminar on the Global Water Crisis in 775 Tan Hall on the UC Berkeley Campus. This event is jointly sponsored by the IIBHB and the U. C. Berkeley Departments of Chemistry, Molecular Cell Biology (MCB), Public Health. Speakers will include authorities on water, environmental, and canopy chemistry, climate science, the water crisis in California, civil engineering, energy storage, and nanotechnology. This year’s discussion will focus on the IIBHB’s “HydroGramin” model, the design of Dr. Rashbihari Ghosh, a Bangladeshi-American scientist, for a complex of villages built around a central reservoir on the principles of sustainable hydrological, architectural, and agricultural development. While serving communities economically and as a source of clean drinking water, irrigation, and aquaculture, HydroGramin projects will, in turn, be used to recharge or cleanse deep and shallow aquifers and will also prevent land subsidence, and address problems caused by sea-level rise. The seminar’s convener, Prof. Richard Saykally, a UCB authority on water chemistry, will address the overall advantage of the HydroGramin model over desalination and the place of both technologies in our planet’s water future. Other speakers include our institute’s advisor, Dr. Randy Scheckman, the 2013 Nobel Laureate in Medicine. We are greatly indebted to Professor Scheckman for his ongoing support of our institute and the insight brings to our development of solutions. Other speakers include Dr. Ghosh, Felicia Marcus, Chair of the California Water Control Board along with other scholars and scientists.